Optional : Avocado, cooked chilled shrimp, a bed of greens. 1. 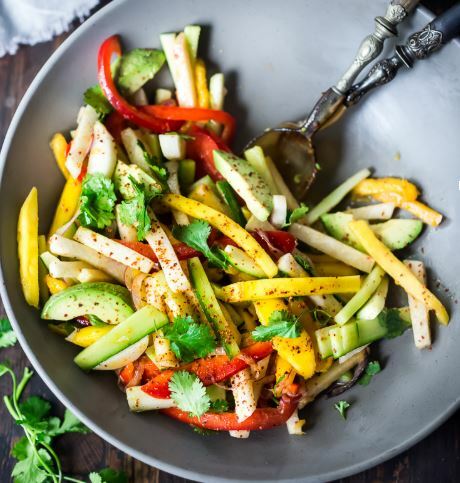 Using a sharp veggie peeler, peel mangos and jicama. Slice mangos into ½ inch thick slices or wedges. Cut jicama into ¼ inch thick matchsticks about 2 inches long. Slice the cucumber in half, scoop out the seeds and cut into long strips, then cut into 2 inch matchsticks. Thinly slice the bell pepper into strips. 2. Place all in a large bowl along with the sliced onions and cilantro. Drizzle with 2 T olive oil. 3. Zest one of the limes and add it to the bowl. Juice the limes, (you should have about 4 tablespoons lime juice) and add it to the bowl. Add salt and chili flakes and gently toss. Taste. Adjust lime, salt and chili flakes. 4. Right before serving you could add avocado slices – just gently fold them in last.